I have become so disillusioned with this series. I was really into it at first, and I wanted it to become huge partly because I was so “in” from the beginning, but the sequel books didn’t really live up to the promise of the first installment, and although I didn’t hate the last book, (Allegiant), it wasn’t exactly as good as I had been hoping. Theo James is definitely too old to be playing Four. His American accent is not consistent. Shailene Woodley as Abnegation Tris is wearing TOO MUCH MAKE-UP! Yes I know it’s a movie but they didn’t have to go overboard obvious with the mascara and eyeliner before she’s even transferred to Dauntless. I still don’t like the over-stylization of Four’s back tattoos. OKAY FINE, I will not be a 100% Negative Nancy, there are some good moments in this trailer. Like when the Dauntless jump joyously off the train at 0:28, and the fear landscape drowning scene from 0:46-0:55, (although in this cut it looks like it’s the aptitude test), Tris jumping off the roof at 1:15, Four’s intense stare in the knife-throwing scene at 1:39. If anything, the disappointing path the Divergent movie marketing has taken just makes me more impressed with Catching Fire which has been consistently killing it. Well, internet, am I the only Initiate not jazzed about this trailer? What did you think of it? I remember it as about a scared girl figuring out her identity as she comes of age and tries to survive in a dangerous society that has a lot of secrets. And her understandably confused feelings. 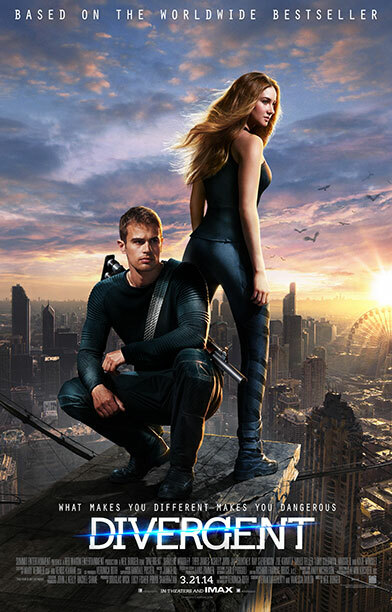 And the divergent thing was a catalyst for it all, but not the main theme. But I also read the book pretty fast quite a while ago. Everything from the marketing to the storyline has been compared to the hunger games. I don’t blame the marketing team because i feel the storyline is pretty mediocre when you break it down. The reason catching fire’s marketing has been so good is because the story is EPIC and even though divergent is an entertaining read, the story isn’t nearly as compelling as Catching fire. I don’t have a problem with the cast and the marketing may not be indicative of the movie’s quality. Now that you’ve actually scene the movie, was it as terrible as you’d expected? Worse? Better?